I had to search my own blog for the last time I posted about something that vexes me. I'm thinking the change in attitude leaves me much less likely to be vexed about something. But, this has cropped up and it's worthy of a vexation. I'm a week past an RA visit. At the time of the visit, I was coming off a minor flare up of the RA. Normally, I have a pretty good idea of what caused the flare. This time, I had no clue. It could have been the amount of field time I've had to do lately. It could be fall allergies. I was feeling rather smug back in April when everyone around me was sniffling and snorting and snuffling with spring allergies and I wasn't affected, not one iota. Normally, I suffer along with them, but this year, nothing. So fall comes and, well, karma's gonna get you. I walked into Dr. Francis' office with one bright red eye which was itchy and watery, sneezing and the biggest case of post-nasal drip I could remember. I felt like I'd been hit by a truck. All of this is normal for allergy season when I don't take my meds. The plain old generic allergy stuff works, but it's only good for 4 hours. I have to remember to take it. Ah yes. My downfall. Instead of the generic, Dr. Francis told me to get Zyrtec, Claritin or Allegra, "Whatever is on sale. Make sure it's the 24 hour stuff which you take at night because it can make you sleepy." As I had to go to CVS to pick up the month's medications, I figured I'd buy whatever was on sale. It turned out to be Claritin. Now, I can accumulate a lot of pill bottles. CVS will take the empties and recycle them so I make a stack on the microwave and when it's time to get the next month's batch, bring those along. I take another medication at night so I had the bright idea to put the Claritin in an empty bottle and keep it next to the other medication. Then I wouldn't forget to take the Claritin. I know that if you can get the paper name backing off the pills, they are reasonably easy to push through the blister pack. I couldn't get it off the back of the pills. The amount of force needed to push a pill through the whole mess exploded a pill because these are gels. I tried slicing through the top plastic with a knife, but felt that was just a slip away from slicing open my hand. So, I wound up using a scissors to cut open the packages. I have a month's worth of Claritin and I see Dr. Francis again in a month. If she wants me to continue with an allergy medication until the first frost, I'm going to look at Zyrtec because I know it comes in a bottle. 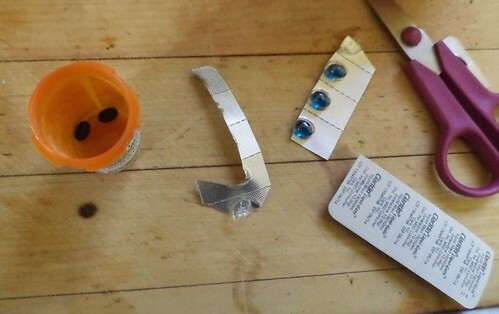 I cut up one blister pack worth of pills. That's all I could handle doing at one time, it frustrated me so. On a side note, the rumor about CVS trimming back sales receipts isn't a rumor. They have. The top receipt is for my medications. I've got some good coupons there that may entice me to come into the store when I don't need to pick up pills. The bottom receipt is for a few other things I bought. The bottom receipt is the whole thing, not cut apart. Now, the printer on their register wasn't printing the left half inch but it did get the whole bar code they need to accept the coupon. I think people still believe their receipts are way too long and I agree, but this is a step in the right direction.